Home / Whole Food Kitchen / Healthy Ingredients / Madhava Organic Blonde Coconut Sugar, 6 lbs. This unrefined sweetener made from the sap of coconut flowers is sustainably produced, and nutritionally superior to white sugar. This is the only sugar I use in all my recipes that call for sugar. Madhava Blonde Coconut Sugar is an organic, all-natural sweetener produced from the flower buds of the coconut tree. With a mild and sweet flavor, Blonde Coconut Sugar provides a perfect one-to-one replacement to refined white sugar and you can enjoy it in all your favorite things from baking to sweetening your smoothies, coffee and more. Nutritionally rich and minimally processed, organic Blonde Coconut Sugar contains magnesium, potassium, zinc, iron, B vitamins and amino acids. It is naturally allergen free, and is sustainably produced without the deforestation common to the production of cane and other sugars. The coconut palm tree produces 50% – 75% more sugar per acre than cane sugar, while only using 20% of the resources. Learn more about 25 different types of sugar here. 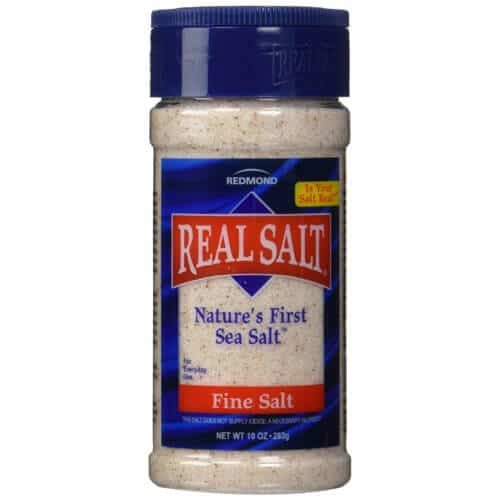 Redmond Real Salt – 10oz.